At this point, most of our readers are familiar with what the next iPhone is going to look like, including the fact that it will feature a unibody design with a two-tone metal backplate. But what’s the story with that metal backplate? Has it been designed that way just to look good and set itself apart from the design of the iPhone 4/4S, or is there a more cogent design philosophy behind the three alternating stripes of metal and glass? We won’t know for sure what Apple is thinking until the iPhone 5 is officially announced, but one industrial designer has a great theory about why the back of the next iPhone looks the way it does. As is usually the case with Apple’s design, the new iPhone’s back plate doesn’t just look good… it’s incredibly functional and magnificently strong. Over at the The Techblock, Chicago-based industrial designer Don Lehman dissects the design of the next iPhone, and puts the design decisions being made in the context of what has come before. When the iPhone 4 first launched, it was a GSM-only phone, meaning it only worked on cell networks using the GSM standard. (AT&T, yes. Verizon, no.) The GSM iPhone 4 introduced the idea of an external metal-band antenna. It broke into two sections. One section for cell/data reception, and another section for GPS, Wi-Fi, and Bluetooth. This design worked but was also susceptible to a signal degradation if gripped in the wrong spot (aka Antennagate). When the CDMA version of the iPhone 4 came out in February 2011, the design of the steel bands changed. This design would also carry over to the 4S. The 4S’s steel band is comprised of four pieces of steel: two U-shaped pieces at the top and bottom, and two long, flat pieces on the side. The steel sections don’t actually touch each other — they are separated by a .65mm piece of plastic. The way I understand the 4S cell antenna to work is this: There are two antennas, one at the top U bracket, and one at the bottom U bracket. The flat steel sides are only there to visually continue the metal band all the way around the phone and for structural reinforcement. 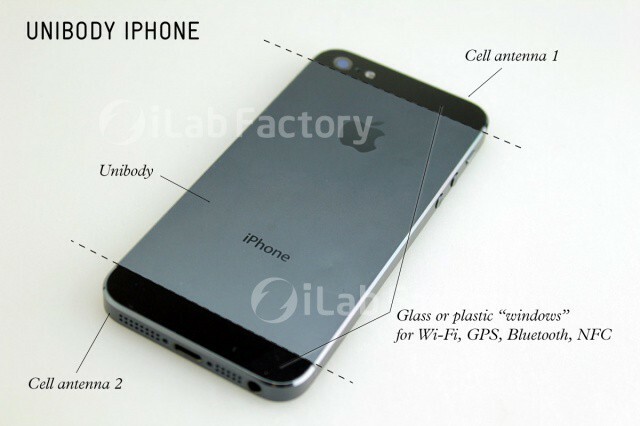 The GPS, Wi-Fi, and Bluetooth antennas transmit out of the glass backplate. Long story short, instead of using the entire metal band for antennas like in the 4, the 4S only uses the top and bottom sections as antennas. Since the flat sides don’t contribute to transmitting signal and only help with the structure of the device, it makes sense to make them even more integral to the structure. This is what makes a unibody iPhone possible. This is a really interesting theory. What is especially interesting to me about it is that it explains why the new iPhone’s backplate is comprised of two small stripes of what appear to be standard Gorilla Glass with a big plate of aluminum unibody in the middle. It looks good, but it’s also a very different design choice than the kind Apple usually makes. According to Lehman’s theory, though, the metal part of the back plate makes the device significantly stronger, while the “strips” of Gorilla Glass allow the WiFi, Bluetooth and GPS antennas to peer out. Very smart. It’s really worth reading Lehman’s entire article: he’s got a lot of very smart, very experiential things to say about the new iPhone’s design that go way beyond what we’ve outlined here. His article makes a good case for the fact that the next iPhone won’t just be the prettiest or thinnest iPhone yet, but the toughest one ever made too. Check it out at the link below.